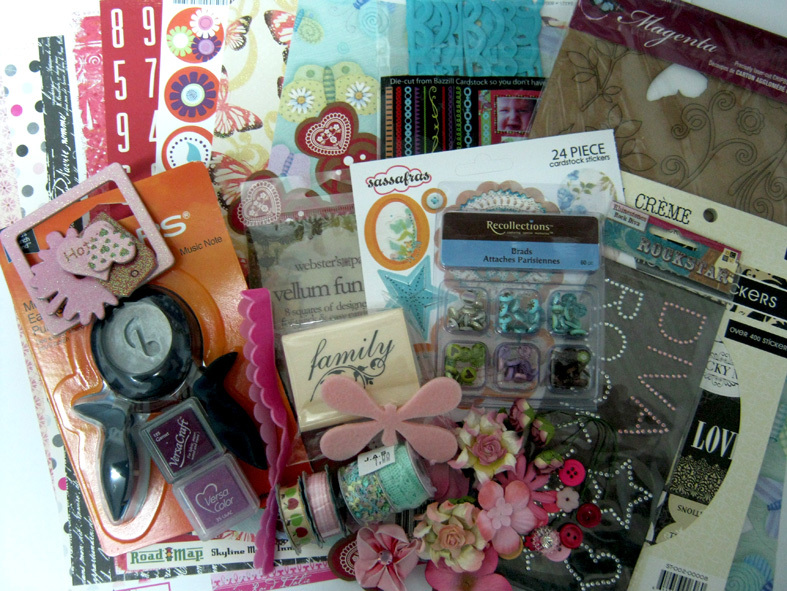 scrappin it: Birthday Blog Candy #2! another chance to win! Birthday Blog Candy #2! another chance to win! It's time for blog candy # 2 in my four birthday blog candies series. But before I show you what kind of goodies wait for you this week I have two important tasks: first, thank all of you for your great birthday stories, wishes and congratulations! You really warmed my heart. Second, announce this week's winner!! And the candy goes to…. Please send me your address so I can send you all the yummy things. My favorite birthday was last year, because my eldest son, who was 10 and a half at the time made me an amazing present. He made me a scrapbook all by himself, with photos, embellishments and even journaling. He came to me and said: "Mom, I made a traditional scrapbook for you" (he meant that it's not a digital scrapbook). I was so moved, happy, excited, surprised and very very proud. After all what a better present can a designer like me receive? It wasn't just that he made a scrapbook on his own, putting all his creativity and love into it, there was also a hidden gift, with a hidden meaning…someone was going in my footsteps. Someone feels the same magic I feel. And it's not just anyone…it's my son! What a great feeling. And with no further delays, here is this week bundle of yummy stuff! 1. Leave me a comment and tell me what was or will be your ideal present. 2. Become a follower of this blog (leave a separate comment telling me this). 3. Subscribe to Scrappin' it (leave a separate comment telling me this). 4. Share my blog candy on your blog/social media site (leave a separate comment telling me this). Good luck! I'll post the winner next Friday! Also I'm a follower of this beautiful blog! Another great lot of candy, my idea present right now would be your candy LOL but really would like some maja design paper. I have posted your candy on my sidebar. OK, my ideal present was arounf two years ago, my husband and son gave me a GC to nail salon, then they took me to get few V'S body sprays and lotions, a nice dinner at our favorite restaurant and we ended the day at my favorite LSS!!! I already told them this year I want the same thing!!!! I shared the link on FB!! Hello! My ideal gift would be a small house to enjoy with my daughter. Thanks for the opportunity to participate. I'm a follower of this beautiful blog! What would be your ideal present....Well, what you got would really be something that would touch my heart and turn my "would be" ideal present into a "was". I do subscribe to Scrappin' it! Since I am in the middle of a Blog Hop for the Design Team I'm on! I will have to leave your blog candy on my side bar until Monday. Another blogcandy? Wow! thanks! this one looks even better! המתנה האידאלית שלי היא טיול עם האנשים האהובים עלי עם מלא פינוקים בדרך! אני פוללוור, לא הפכתי ללא פוללוור רק כי לא עליתי בגורל! ואני גם מנוייה לבלוג שלך! אני מעריצה מושבעת! המתנה האידאלית שלי תהייה סדנא עם טים הולץ (מותר לפנטז) ובכלל סדנאות חו"ל... שבהם אפשר גם ללמוד , להכיר ולעשות שופינג תואם... אורית ב. ומנויה על הבלוג כמעט שנה... אורית ב. Another yummy candy, that's great! My ideal present is a trip abroad with my DH, but in the meantime I'll settle for scrap stuff which enables me to make gifts for other people. שמתי תמונה וכתבתי בפייסבוק שלי. הבלוג קנדי שלך הולך ונהיה שווה יותר משבוע לשבוע! איזה כייף , תודה. המתנה האידאלית מבחינתי היא טיול טבע עם פיקניק או ארוחה בסופו... זה כיף גדול. The perfect present is just not having to cook dinner! Love going out! My ideal present would be one of those newborn surprise Cabbage Patch Dolls! I know it seems simple, but I used to have one as a child and I just adore them! hi Einat' thanks for the wonderful things you share. my ideal present would be at least 3 more hours a day...lots of energy but no time.congrets nili, aynat. מתנת יום ההולדת האידיאלית היא חומרי יצירה יקרים שאני תמיד מתבאסת שאם אני קונה אני צריכה לבחור רק אחד כמו חותמות מאוד שוות של טים הולץ או תבניות מיוחדות לקאטלבאג או, אם נחזור רגע לתפירה, מכונת אוברלוק! בקיצור כל מה שישדרג את עולם היצירה שלי! ואני כמובן מנויה ועוקבת אחרי הבלוג הנהדר הזה! Loving this chance to win. My ideal present for my birthday, which is today, would be to have all my children here with me. We are more than 13 hours apart. I have been following this - enjoying it! I am a subscriber! You had me at hello. You will find that I am sharing this on my facebook account. Have a wonderful day! בלוג קנדי שווה ביותר ומזמין. My ideal present is spending the whole day with my beloved boyfriend, as we celebrate on the same day, so we'll make each others day perfect. that's the kind of birthday I've had over the last 4 years. however, not his year... well, better luck next year, I guess! and, yeah, I'm a follower of this blog. thanks for the chance and lots of love! happy late B-day! התגובה הקודמת שכתבתי לא נקלטה... המתנה המועדפת עלי היא השתתפות בסדנת יצירה או חומרי יצירה. וכיף שאת נותנת סיכוי נוסף לזכות! תודה. בשנה שעברה ביקשתי נעלי בית עם אזניים. My ideal present would to have my brother stay home. It's lonely without him. Thanks for the chance to win! what a great prize! my ideal gift would have to be a long vacation over seas! I'm now a happy subscriber! 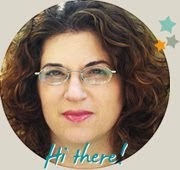 Hi Einat, thank you so much for the chance to win!! My ideal present is to be with all my family, perhaps it's very simply, but I have one of my boys and his family living in Argentina, and it is very hard to me. And here is the picture of your blog candy..
המתנה המושלמת בשבילי זה יום שלם של יצירה..
אני גם מנויה לעדכונים מהבלוג..
נראה לי שבסוף אני אלך על המון חומרי יצירה שווים, שזה משהו שאף פעם אין יותר מדי! Hi, I was here for the IIG blog hop but now back to visit your blog and what a nice surprise the chance to win this fav candy.... My ideal present will be a big scraproom LOL I know that sounds more like a dream present tha ideal LOL. I put a link+pic in my side bar blog. עינת, אני מנויה על הבלוג המקסים שלך!